Also serving communities of Willis. There are 23 Assisted Living Facilities in the Conroe area, with 16 in Conroe and 7 nearby. The average cost of assisted living in Conroe is $3,008 per month. This is lower than the national median of $3,346. Cheaper nearby regions include Montgomery with an average starting cost of $2,400. To help you with your search, browse the 158 reviews below for assisted living facilities in Conroe. On average, consumers rate assisted living in Conroe 4.1 out of 5 stars. Better rated regions include The Woodlands with an average rating of 4.3 out of 5 stars. Caring.com has helped 12 families in Conroe find high-quality senior care. To speak with one of our Family Advisors about assisted living options and costs in Conroe, call (855) 863-8283. Conroe is one of the largest cities in the Houston metropolitan area and was the fastest growing city in the U.S. for its size in 2015. Despite its sustained rapid growth, Conroe’s senior population of 12.5 percent is only slightly above the state's senior population of 12.3 percent. Senior residents in Conroe can receive help with personal care and activities of daily living at one of 37 local assisted living facilities, with 15 in the city and 22 in nearby areas, such as Montgomery and The Woodlands. These facilities, and others throughout the state, are regulated by the Texas Department of Health and Human Services. The overall comfort level of Conroe’s climate is above average for the U.S., with a score of 69 on a scale of 100. The drawbacks for seniors who enjoy outdoor activities will be high humidity and the average high temperature of 93 degrees Fahrenheit in July. The average low temperature in January is about 41 degrees, so cold weather is rarely a concern for seniors. Conroe’s cost of living is about 3 percent below the national average, striking a balance between the higher costs of a major metropolitan area and the lower cost of living in Texas. Groceries in Conroe cost 9 percent below the national average, but all other living expenses are within 3 percent of the national average. Conroe is an affordable town compared with most other cities of its size. The crime rate in Conroe is 21 percent greater than the national average. However, the rate of violent crime is well below the state average, so the primary concern for seniors is property crime. Conroe Connections is this city’s own mass transit service, which includes separate routes for north and south Conroe. Seniors 65 and over pay half the standard fare with a Transit ID. Conroe has an array of community resources for seniors, including The Friendship Center, where seniors can eat a hot, nutritious lunch each day and participate in a variety of games, fitness classes, hobbies and adult education. The Conroe area is home to world-class medical facilities, including Conroe Regional Medical Center and Aspire Hospital, in the event of medical emergencies or illness. Assisted Living costs in Conroe start around $3,008 per month on average, while the nationwide average cost of assisted living is $4,000 per month, according to the latest figures from Genworth’s Cost of Care Survey. It’s important to note that assisted living rates in Conroe and the surrounding suburbs can vary widely based on factors such as location, the level of care needed, apartment size and the types of amenities offered at each community. 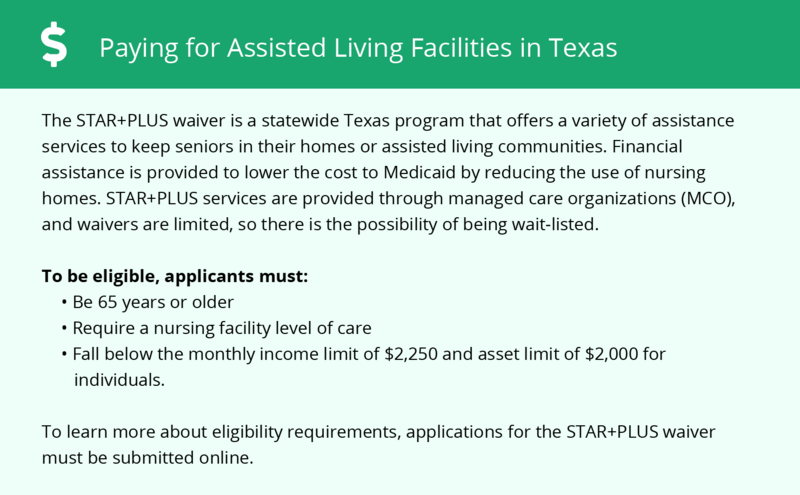 The Texas Community Care for the Aged / Disabled program provides seniors at risk for placement in a nursing home with financial assistance. 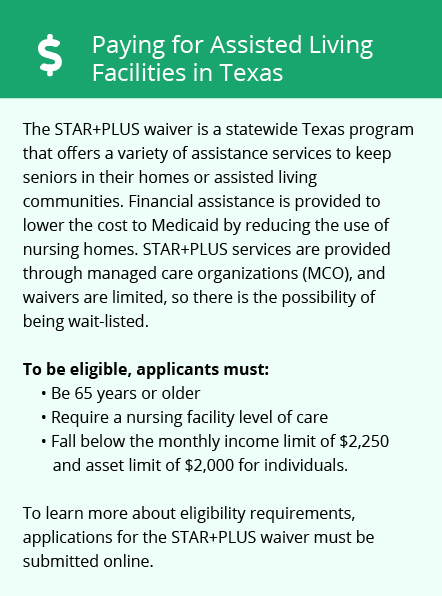 Seniors with Medicaid may also be eligible for financial help through the STAR+PLUS program. Conroe and the surrounding area are home to numerous government agencies and non-profit organizations offering help for seniors searching for or currently residing in an assisted living community. These organizations can also provide assistance in a number of other eldercare services such as geriatric care management, elder law advice, estate planning, finding home care and health and wellness programs. To see a list of free assisted living resources in Conroe, please visit our Assisted Living in Texas page. Conroe-area assisted living communities must adhere to the comprehensive set of state laws and regulations that all assisted living communities in Texas are required to follow. Visit our Assisted Living in Texas page for more information about these laws.